The Council of the Dartmoor Pony Society has decided that in 2009 the Society will cease to take stand space at various shows and events. Recognising that Society Members and the General Public will still wish to obtain items and support the Society, it has been decided that it will be mail order only for the foreseeable future. A range of items are available. Dartmoor Breed Champions 2001 to 2012 is now available! This is the sequel to the “Dartmoor Breed Champions from the 1940’s” which was produced in 2001 by Elizabeth Newbolt-Young from the Shilstone Rocks Stud. This second edition costs £10 and contains photographs of some of the best ponies of our breed from 2001 – 2012 inclusive. 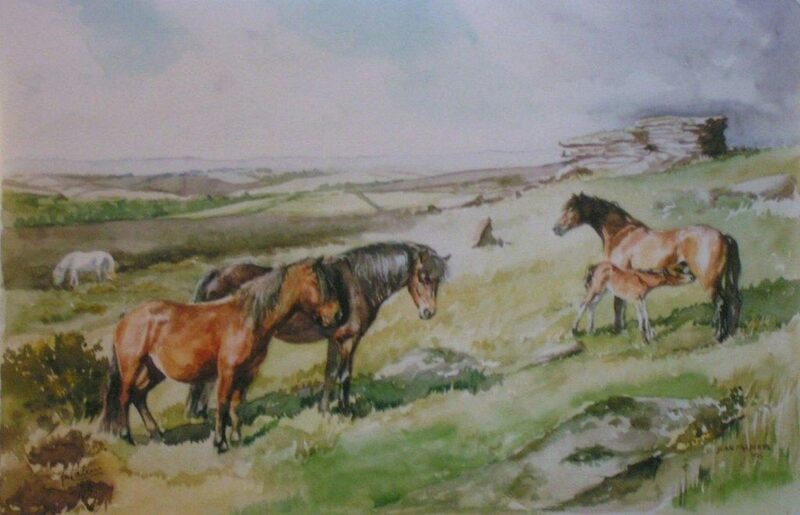 The first edition can still be purchased from the Dartmoor Pony society for £5. Elizabeth’s love and passion for the Dartmoor Pony, inspired her to produce these photographic and ancestral records for all to see in the form of these books. They both contain photos and breeding of all the champions since 1940s and make fascinating viewing for anyone interested in Native Ponies. To order the latest edition only please send a cheque for £11.50 (to include P&P) to Mrs E. Newbolt-Young. To order both editions please send a cheque for £12.50 (to include P&P) to Mrs E. Newbolt-Young plus a separate cheque for £5 to The Dartmoor Pony Society. Please include a note of your request. Please note that all who kindly helped sponsor the book will receive a free copy in due course. Each print has been numbered, and the original painting was signed, and these prints are from a limited run of only 100. The size of the print is approximately 450mm x 298mm (17¾ inches x 11¾ inches). £25 plus post and packing. If you require 2009 or earlier stud books please contact the Office on 01269 844303 or e-mail: secretary@dartmoorponysociety.com. Stud books are published in July each year. The office does have some Dartmoor Diaries from previous years available for purchase, for details and cost please contact the office.